Paul, F., A. Kääb, M. Maisch, T. Kellenberger, W. Haeberli (2001). 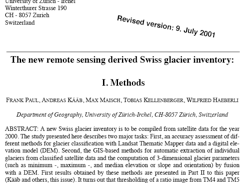 The new remote sensing derived Swiss glacier inventory. 4th International Symposium on Remote Sensing in Glaciology, Maryland. GLIMS- Global Land Ice Measurements from Space. •Alps had glacier advance until about 1985 and a strong retreat after. •SGI 2000 = Swiss Glacier Inventory of 2000 – conducted because previous survey in the 70’s was done by aerial photography and computed in 2D area…. Now there is GIS. Small glaciers were not considered in the original inventory. •He assesses the accuracy of the TM derived glacier areas by comparison with high resolution SPOT (panchromatic channel) but again, spot can’t see under glacier debris…. 1.Bayer et al, (1994) using DN’s and segmentation of ratio images from various band combinations. 2.Unsupervised Classification - ISODATA clustering with Band 1, 4, 5 as inputs (Aniya, 1996). None of these methods are able to classify the debris covered ice of the glaciers. •In this study a NDSI was tested but the results were less accurate so not shown. Paul says “natural” Difference snow index. Doesn’t he mean “normalized” and isn’t that what I am doing in my research? •The accuracy of the glacier classification with the segmentation of TM4/TM5 ratio image using the raw DN proved to be the best method with respect to glacier arrears in cast shadow and snow fields with accuracies of inferred glaciers better than 3% when compared to a SPOT Pan image. •I’m not sure what they mean by “segmentation” and how do they do the segmentation. Is this the same method I’m using? •This study seems to simply use a non-normalized TM4/TM5 ratio threshold to establish glacial outlines whereas Anne believes a NDSI is better. •Paul suggests using a “Median Filter” to try to capture some of the debris-covered snow areas? Does this seem like a good idea for our research?